Knowing how to fix many plumbing-related problems in a parks and recreation center can be a great convenience. Just think of all the money you can save getting an overflowing toilet or a backed-up sink under control, instead of waiting for a plumber to arrive. Fortunately, most plumbing problems do not have serious implications. Instead, they fall more into the realm of the frustratingly common plumbing issues parks and recreation managers must deal with frequently. The following are some of those problems and their solutions. Toilets probably are more problem-prone than any other restroom fixtures because they have the most moving parts of any other fixture, invariably needing repair or replacement at some time. Let’s start with a toilet that won’t flush (drain). The problem is most likely the result of an obstruction in the downstream of the water in the bowl. If water pressure is adequate, using a plunger is the first way to address this issue. Allow as much water as possible to empty down the drain of the toilet, and then turn off the water to the toilet. Begin plunging, never breaking the seal with the bottom of the toilet. This forces the water in the bowl down the drain. Now turn on the water, let the bowl fill, and see if the toilet is working. If not, the toilet may need to be “snaked.” A snake, or auger, as it is called by plumbers, is a coiled wire manually inserted in the toilet that removes clogs that cannot be removed by plunging. There are machine-powered snakes but these are usually not necessary. Snakes come in a variety of sizes, are available at hardware stores, are easy to use, and will almost always remove clogs and fix the problem. By the way, the same process is used to repair a clogged sink or urinal. Another common toilet problem is water that doesn’t stop running. Pressing the handle a couple of times may provide a temporary fix, but often this means further repairs will be needed soon. In many cases, the flapper, along with the parts that control it, need to be replaced. These parts are all available in hardware stores and are inexpensive. If directions on the package are followed, repairs should take 30 minutes or less. While clogged food-service sinks can be repaired using the snake system discussed above, a reoccurring problem with the same drain will have to be investigated further. If a dishwasher is connected to the sink, melted grease may be released in the pipe; the grease thickens as it cools, eventually causing the pipe to clog. This is a common problem in restaurants. Addressing this situation requires simply scraping the grease off pots, pans, and plates into the trash before placing them in the dishwasher. Another common yet fixable plumbing problem is a leaky faucet. This can typically be repaired by replacing the washer. While there are several steps to replacing a washer, it is not a difficult process, and simple directions are available online. Again, the repair process should take about 30 minutes. Foul restroom odors may be caused by ineffective cleaning, but there are two other culprits to consider as well. Often the ceilings attract moisture, which allows bacteria to grow and then release odors. Airing the restroom and cleaning the ceiling often takes care of this situation. If the ceiling is not the problem, then it is likely the floor drain. Pouring water in the drain provides a temporary fix. A more permanent solution is to use a liquid drain sealer. As some parks and recreation facility managers know, virtually all drains by code require a U-shaped or J-shaped pipe. Water fills in the curved area of the pipe, which keeps sewer odors and airborne impurities from being released. If the water dries out, the odors and impurities can escape. Drain pipes that dry out are actually quite common in facilities, especially those used infrequently, such as schools and even park and recreation centers closed for long periods of time. To fix this problem, pour a small amount of a liquid trap sealer, often referred to as “ever prime” or liquid primer into the drains. These products are inexpensive and can seal drains for months, even years. There are many more common plumbing problems that parks and recreation managers encounter on a regular basis. 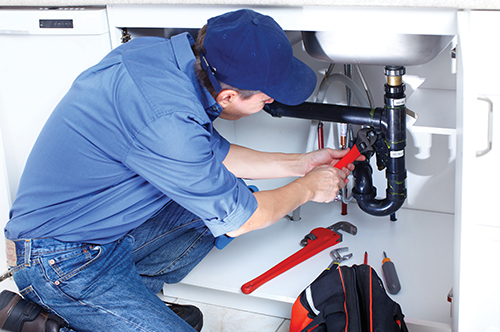 When problems do occur, many managers just assume a plumber is required. While plumbers certainly should be called to address more serious plumbing issues, many of these problems are fixable in-house. Dawn Shoemaker is a freelance writer for the professional cleaning and buildings industries.